After reading my DAC post, some friends asked me what exactly is my "PIMETA headamp". 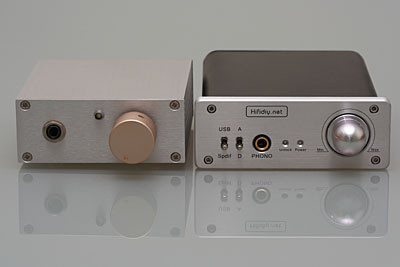 The PIMETA headamp is the box on the left. Well, first of all, headamp is an amplifier for headphones. It takes the audio signal from the source, amplify it (can be both in terms of voltage and current), and drive the headphone. 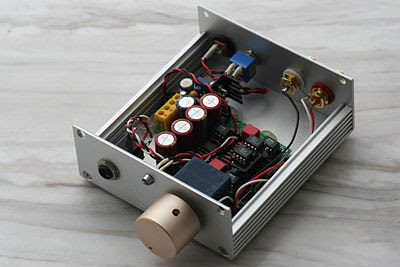 This particular headamp that appeared with the DAC is a PIMETA that I built a few years ago. It is simple to built and tune. The big blue box is an Alps volume control. The four red cylinders are Elna Cerafine capacitors. The little board on the side with yellow sockets is my DIY voltage regulator to provide clean power to the headamp. I fitted this headamp with 6 x BUF634. BUF634s are buffers that provide enough current to drive the headphone. They also help to drive the headamp "deeper" into Class-A. 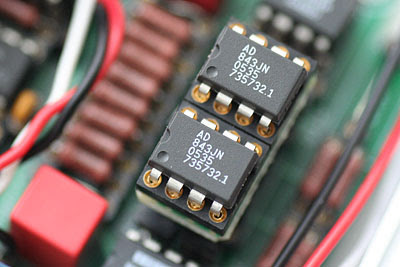 3 x AD843 op-amps provide the voltage amplification. Different op-amps have different sound signature. 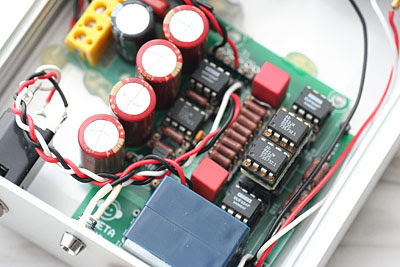 Op-amp swapping is the easiest way to tune and modify this headamp. Close up on the op-amps. These 2 are for the left and right channels. The other OPA843 is on another socket for the ground channel. how do u rate the ad843 against opa627?